The Cardboard King in Oz, by Gil S. Joel – The sequel to Joel’s Healing Power deals with many of the same characters, this time in vignettes rather than a book-long story. The confidence man Willie Lie returns to Oz and tries to set himself up as Prime Minister, the King of Spades becomes a doctor, the Nome Terrido again attacks the Emerald City, Williams the Robin explains how he became Mayor of Metro Town, and the two pterodactyls Ruthie and Toothie get married. There’s not a lot to most of these, but they’re pretty cute. The idea that the Emerald City has multiple districts with their own representatives is a bit weird; it’s not like the city is that big. Also, the Wicked Witch of the West is alive again and just kind of hanging around with nobody being that concerned about it, which I think might be a holdover from the Wiz Kids books. 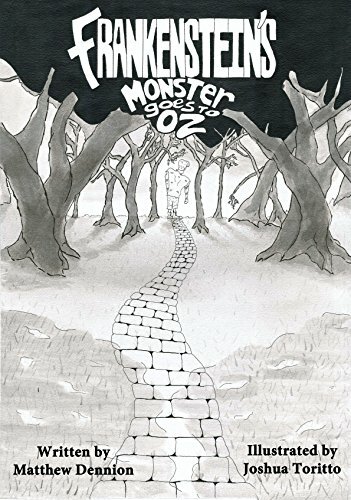 Frankenstein’s Monster Goes to Oz, by Matthew Dennion – I’d seen it suggested before that Victor Frankenstein’s creation from the Mary Shelley book potentially could have been accepted in Oz, and this short tale, only a few pages long with stylized shadowy illustrations by Joshua Toritto, explores this scenario. The Monster is blown to Oz and visits with most of the characters from the first Oz book, then finally finds a home. I wrote the Monster into my own “Halloween Island,” which was just posted at the Royal Timeline website. While I hadn’t read this yet when I first wrote it, I worked in the scenario from Dennion’s story. And Justice for Oz, by Lark Vandergrace – The third book in a series about the Winged Monkeys, centering around their Queen Diamond Ann disappearing and her nasty sons taking over. While each of the books in the trilogy credits a different author, they all incorporate Chris Dulabone’s sense of humor. The last book revealed that Diamond Ann had been sent to another planet in the future, and that two of the Monkeys had recruited the Scarecrow and Patchwork Girl to help them find her. During the course of the story, the searchers visit some of the communities from Ruth Plumly Thompson’s later Oz books. It’s considerably less bizarre than Take Me Back, much of which involves mockery of temp agencies and industrial espionage in space, instead focusing more on Oz itself. That said, I do think the explanation for how Diamond Ann gets back to her own time is a cop-out, although it was cool to see the Kinglet of Phreex and Sir Pryse Bocks from The Magical Monarch of Mo again. The only interior illustration this time is one picture by Jared Davis that appears at the heading of every chapter. 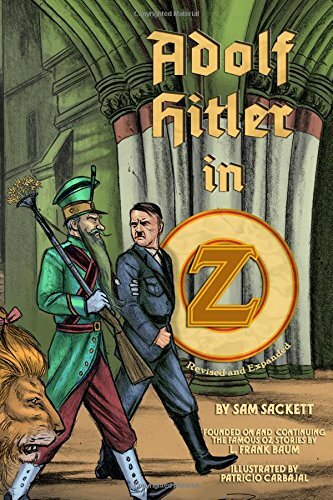 Adolf Hitler in Oz, by Sam Sackett – I was a little apprehensive about this one, as making someone responsible for millions of deaths into an Oz villain seems perhaps a bit too whimsical, I think it mostly works. It does seem like Hitler varies between being truly evil and more of a silly threat, but a lot of the latter is just due to his not being familiar with how Oz works. Some of the humor also comes from the fact that Hitler’s first two allies in his conquest attempt are doppelgangers of Laurel and Hardy. (Their presence is explained in Ali Cat, although if they were really transported to Oz in 1939, shouldn’t they have at least heard of Hitler?) He’s never really that much of a threat, as Ozma is watching the whole time, but we still see some sign of how he’s able to cajole people into following him. He visits several places that fit well into Oz, including a community centered on running and a city on the edge of a volcano. Another reviewer has commented on how Hitler’s ultimate defeat relies on an aspect of the Golden Cap that isn’t spelled out until afterwards, which I’d say is valid; at least some mention of it earlier on might have been a good idea. The dictator is then taken to Tollydiggle’s prison, where she slowly begins to reform him. Sackett elaborates quite a bit on the Ozian criminal justice system as described in Patchwork Girl and not really addressed after that, espousing the philosophy that anyone has the potential for empathy and goodness. While this may be true, I guess I also kind of think there are some people who have done so much bad that there really isn’t much point in trying anymore. But then, I’m not Ozma or Tollydiggle. 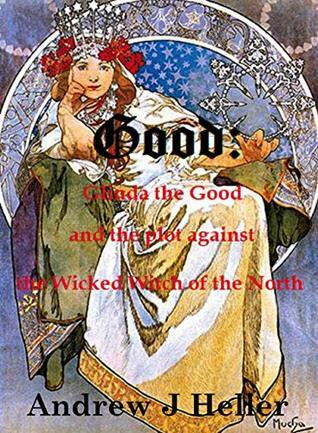 Good: Glinda the Good and the Plot Against the Wicked Witch of the North, by Andrew J. Heller – The prequel to “The Puppet-Mistress of Oz” tells the story of Sarah Johnson, a missionary’s daughter from the Illinois Country, who is taken to Oz by Glinda to defeat the Wicked Witch of the North. In an interesting reference to the Chronicles of Narnia, this witch is said to be from Charn, also the old home of Jadis. After being abandoned by Glinda’s apprentice on the Sorceress’ own orders, Sarah joins up with two new friends, the Logical Kalidah Philos and the Dust Devil Dusty, who have some amusing dialogue. In an extension of the “Puppet-Mistress” characterization, Glinda is obsessed with getting rid of the Wicked Witches, willing to use others in the process. While definitely fun in parts, it’s a bit of a downer overall; but it’s a clever exploration of the nature of goodness and the concept of the greater good. This entry was posted in Authors, Book Reviews, C.S. Lewis, Characters, Chris Dulabone, Chronicles of Narnia, History, Humor, Jared Davis, L. Frank Baum, Magic, Magic Items, Monsters, Oz, Oz Authors, Philosophy, Places, Ruth Plumly Thompson and tagged adolf hitler, adolf hitler in oz, ali cat in oz, and justice for oz, andrew heller, emerald city, frankenstein, frankenstein's monster goes to oz, gil joel, glinda, golden cap, good, halloween island, joshua toritto, kalidahs, kinglet of phreex, lark vandergrace, mary shelley, matthew dennion, morality, nomes, ozma, patchwork girl, pterodactyls, sam sackett, scarecrow, take me back to oz, the cardboard king in oz, the healing power of oz, the lost tales of oz, the magical monarch of mo, the patchwork girl of oz, the puppet-mistress of oz, the wonderful wizard of oz, tollydiggle, wicked witch of the west, winged monkeys, witches. Bookmark the permalink.